Get off Hwy 101 in Goleta at Storke Road. Turn toward the ocean. Go past the Home Depot Center for two streets and turn right onto Phelps Road at the light. Turn into the 3rd parking lot on the right. 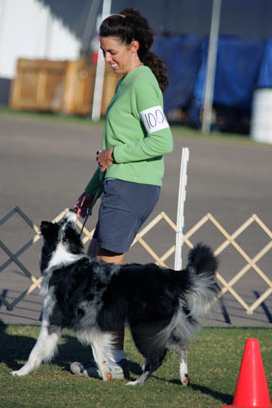 Anne teaches Rally Obedience, AKC Obedience, and Fun With Focus Classes. Rally is a form of obedience that has been designed to be fun and enjoyable for both the handler and dog. You can talk to and praise your dog all during the Rally training (and trialing, should you want to compete). It is similar to agility in that you have a course that you walk to determine your handling maneuvers. Instead of having agility obstacles, there are signs placed along a course that give you instructions to carry out with your dog. For example: Turn Right, Fast Pace, Weave Cones, Stay, and the basics like Halt and Down. Rally is a fun way to work on your dog’s focus and your teamwork, while teaching valuable obedience skills at the same time. The emphasis is on encouraging your dog to pay attention to your handling (great carry-over for agility), but also to be happy and animated. Rally is a great sport for dogs young and old, and for dogs who are at the novice level of training up to the very experienced level. Skills your dog will learn in Rally Classes include paying attention to you and your signals, heeling nicely on a leash, maintaining a stay, and learning an automatic sit when you stop moving. You can come to a session of Rally classes just to check it out, to have a fun hour of play with your dog for an hour a week, to prepare for a Rally trial in the future, or just to improve your teamwork and relationship with your dog. Dogs of all ages and ability levels can play, as well as people too!